Reagan slept well last night and we all slept in a little this morning! She's been a sweet girl again today! We had a house full of people today for Easter...all of Mike's family came. There were a couple times where Reagan seemed to get a little over excited, but she kept calm and was a good girl...even with all of the noise and people. Ryan definitely enjoyed all of the attention from everyone...he's such a ham. It was a good day! 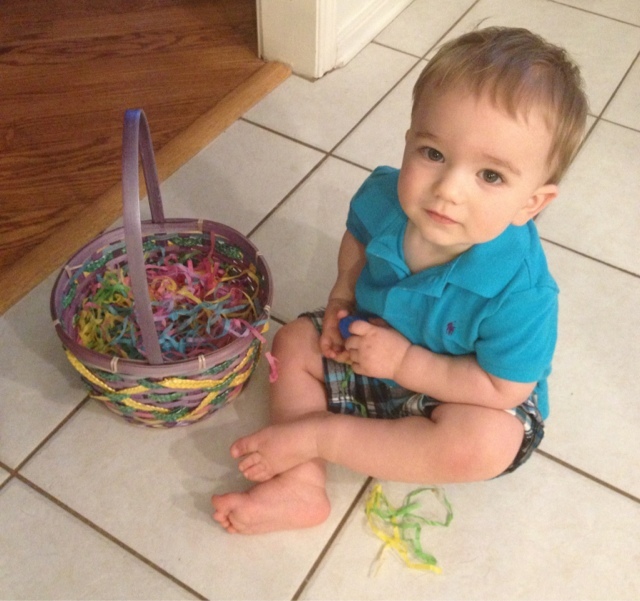 Hope everyone had a happy Easter!! 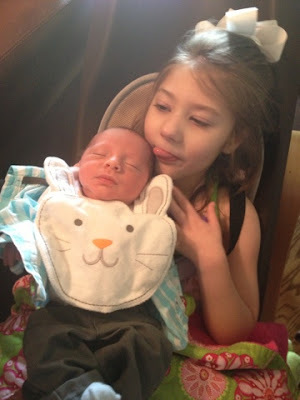 Reagan and her newest little cousin Carter (only 3days old)! Reagan was a little restless last night, but she did sleep (if we would have had a night nurse, it was one of those nights she probably would have held her all night long). Again, I was nervous as to how she was going to wake up, but there was a little smile under all of that hair. She's had her hands in her hair all day long today! From the second she opened her eyes, to the second she went to sleep! She's been very crunchy...constantly bending forward and tangling her fingers up in her hair. She sure has been sweet though. She dozed off for a bit this morning, but other than that, she's been awake all day. I'm hoping the good days continue...we've got Mike's family coming over tomorrow and I'd love for everyone to see her happy! Thank you for keeping her in your prayers! Reagan slept well last night and woke this morning a sweet girl. I was nervous, but sure enough, there was the smile! She's been a good girl again today. We had her follow up with the new neurologist this morning. We were there for more than 1.5hrs before we saw the doctor and Reagan had already dozed off again! We got the results from the 23hr EEG she had last month and it actually looked pretty normal! No seizures (which we already knew), but no spiking either. She said that it was a little slow (which is common/expected with developmental delay), but it wasn't even that slow. I like the idea that the word normal was used when referring to her EEG. Pretty amazing if you know everything she has been through and how chaotic and awful her EEGs once were. I've decided against doing the MRI. It's something the new doctor wanted, but if we're going to change doctors when we move, it doesn't make sense to do one now. Not to mention, it's not going to tell us anything that would change her treatment, and I don't want to risk putting her under anesthesia just so we can see what's going on in her brain! This afternoon Reagan had Speech therapy and we dyed Easter eggs! We've never done it before and it was a mess, but still fun. I think she enjoyed it. Overall she's had a good day today. She was a little sensitive for a bit, but she was fine after another little nap. Hands and feet have been cold and clammy today, so not sure what that means. Hopefully we have another few good days left. We never know with this girl! Ryan has been super fussy/needy today. I'm not sure if it's the fact that he just got another tooth in on the bottom (and has two more on top that look like they'll be through any day). 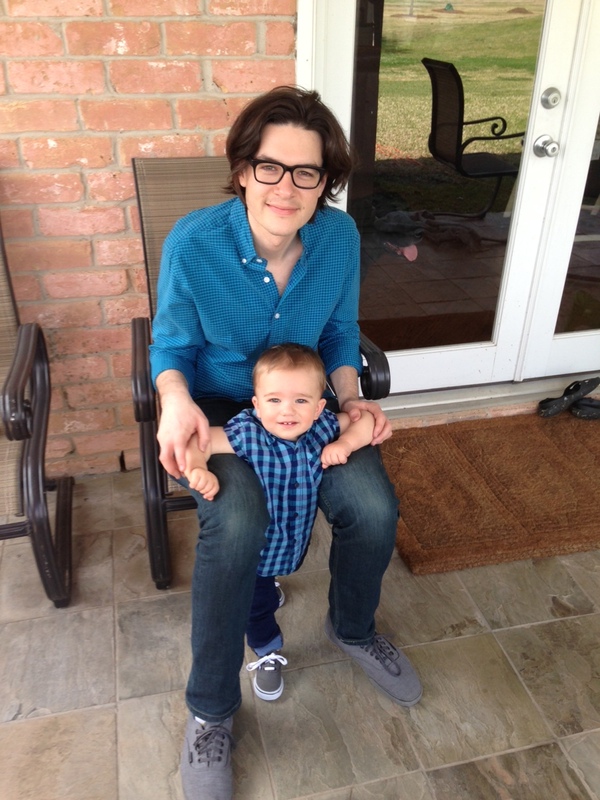 But he did start walking today...had to show off for Daddy since he just got back from out of town. He's been taking a couple of steps at a time and cruising along everything for a while, but tonight he took several steps across the living room (multiple times)! He kept standing up and walking over and over again...like he knew he had finally figured it out! He's going to be all over this place soon! 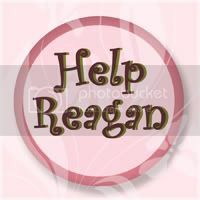 Reagan slept well again last night, of course, we had a night nurse! She actually slept in a little and then woke super sweet again! She's had a good day today. She had OT and speech first thing this morning and then we headed in to town for an appt with Reagan's Physical Medicine and Rehabilitation doctor (PM&R). She said Reagan looked great and definitely more calm with less chorea than usual. Her spine looks good and her feet, well, they're never going to flatten out (but what's more important to us, flat feet or her comfort...definitely comfort). 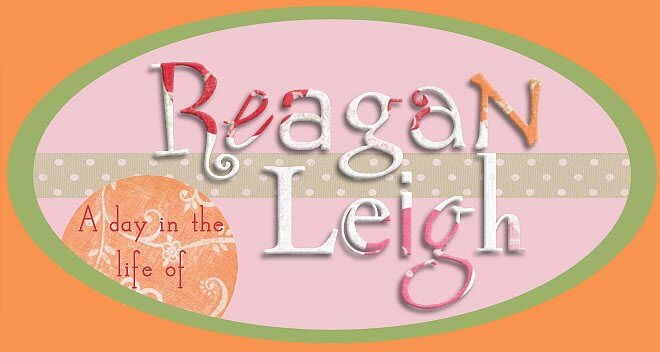 She did say that Reagan was showing signs of precocious puberty (ie breast buds), but that in her opinion, we shouldn't do anything about it (apparently the only issue with it is not growing to their full height potential, and I'm not sure we need Reagan to be ridiculously tall anyway). I think we probably should talk to a endocrinologist about this, but for now we won't worry too much. After our appt, we came home and Reagan had PT and then stood in her stander for an hour. She really has been such a sweet, easy going girl today! Praying for more good days to come! Tomorrow is our long awaited neurology appt (if you remember, the last time we went to see her, we waited 3hrs and then she was whisked off to surgery and we never got to see her at all)! We should finally get the results of her 24hr EEG. Reagan slept well last night...she woke a little sweaty this morning, but otherwise good. She was a sweet smiley girl all morning. She had vision therapy at 10:30am and 15min into her lesson, she fell asleep (in her wheelchair)!! She was OUT! We laid her down and she slept the rest of the day! It wasn't until 6pm that she woke up. She was very quiet and still for a while...I thought she might actually doze back off. Eventually, she woke up more and I was able to give her a bath and get her ready for bed. She was up until 11:30 or so when she dozed back off. I'm not really sure what's going on in that little body of hers, but I sure hope she behaves over the next couple days! We've got a doctors appt tomorrow and another one on Friday! Love this sweet girl. Reagan slept well last night and woke up this morning a happy girl. She's been good all day. She had OT this morning and did well with that. She's eating/tasting food nearly every OT and Speech session now! She seems to really enjoy it and she's tolerating it well. After OT we had a follow up with her new GI doc. Not much to report from that visit. We're going to keep her on the Nutramigen Pure Amino formula (previously called Nutramigen AA)...she seems to be doing better on it than she was on the Neocate Jr (we have lots of cans left over so if anyone needs them let me know). This afternoon she had PT and then we also took a walk again through the neighborhood. The weather is so nice right now...it doesn't get any nicer in Houston! We definitely have to enjoy it while we can! Tonight her hands and feet were a little cold and clammy (the same as last night)...hopefully nothing comes of that. We've got two more drs appts this week, one on Thursday and one of Friday, so I sure hope she continues with the good days! Reagan slept well last night and then had a good day today. She's been sweet and a bit giggly today. She had OT this morning and school this afternoon and she did really well for both! I'm really going to miss her therapists...and her teacher/vision teacher! We're going to move in the next couple months! Mike's branch is shutting down and he's taking a new position (within the same company) and they want us to move to Dallas! Originally they were trying to talk us into moving to California, and then we were thinking maybe Austin, but the decision has been made for us and they want us in Dallas! My mom is thrilled (she and my sister both live in the Dallas area) and I know several special needs moms in that area, so hopefully I'll be able to get some good recommendations for everything for Reagan. Please keep us in your prayers through this transition period. It's going to be rough moving...especially leaving all of our wonderful neighbors here. They have really become family and I'm not sure what we'll do without them! So today was a bad day. But as far as bad days go, it wasn't too bad. Reagan woke up this morning and was kicking around and had a frown on her face. She started crying the second I picked her up...and that was pretty much what she did all day. She was fairly quiet and slept off and on during the day, but if you messed with her, she'd immediately get upset and start crying. So needless to say, that made diaper changes fun! Tomorrow is supposed to be our zoo day, but as of right now, it's not looking good. The weather is not going to be great (overcast, cool, & windy) and we're still really not sure how she's going to wake up! Please keep our sweet girl in your prayers! Reagan slept well last night and woke up this morning all smiles and super sweet! It really has been a great day for her. And what makes that even more special is that today is Reagan's 6th birthday!! She had OT and then speech this morning and then we packed up and went to the mall! We went to Build A Bear and Reagan picked out a bunny! She seemed to enjoy the whole experience! Then we ran by Gymboree, of course, and I stopped by a bakery to buy her a cupcake for later. We headed back home and she had PT and then her therapist put her in her stander and she had vision therapy while standing! Afterward we left brother home with our neighbors while we took Reagan for a quick pedicure. They didn't massage her as much as I was hoping (so we'll have to go somewhere else next time), but she got her first pedicure and she's got some cute pink toes to show for it! Such a great day for my girl! I have LOTS of pictures that I'll have to upload tomorrow. Tonight she did get a little nauseous and threw up a few times (I don't even remember the last time she threw up...I'm wondering if the cupcake icing made her sick). I'm going to switch her over to pedialyte just to be careful. Hopefully she sleeps tonight because our new night nurse was a no show! Keep it in your prayers that she feels better and that the cold feet she had this afternoon have nothing to do with the days to come! Reagan slept most of the night last night. She woke a couple of times, but went back to sleep after a quick diaper change. She woke up happy again this morning...this girl, she continues to amaze and surprise us! She's had a pretty good day today. For starters, she was awake ALL day! She's been very laid back and calm most of the day. Her hands and feet have been nice and warm...overall she's just been a little more normal. There were a couple of times where someone's tone of voice set her off a little and she got over excited...but she kept calm and carried on! She had speech at noon and she did very well...gobbling up some pears with oatmeal and cinnamon! Then this afternoon she had school and she enjoyed that as well! Such a sweet girl. I hope she continues to have good days. Is it possible she slept off her bad days?? Maybe wishful thinking...but one can hope! So...it's been a weird couple of days for our girl. She slept nearly the entire day Sunday, even more yesterday and then the entire morning today! She had me texting her doctors discussing possibly taking her into the ER to get checked out (and moving up her MRI scheduled mid April). We decided to just wait and see, since all of her vitals looked good and she was having short periods of awake time each day. She finally did wake up just before 2pm today...just in time for PT! She was awake and happy the rest of the day. She's definitely a little on edge, tonight she was close to tears a few times just from something as simple as us talking too loud, a commercial on tv, or her brother fussing! I picked her up tonight and was holding her (in the poo poo position) and she finally went (it had been several days) so I'm hoping that settled her tummy and helped her feel a little better! Speaking of tummy...this morning when I was giving Reagan her medicine I noticed her pump extension was plugged into her G-TUBE!!! (nothing goes into her g-tube...everything is supposed to go in her j-tube) Needless to say, I freaked out! I have no idea when it came out and when it was hooked up to her g (the new night nurse denied doing it...a whole other issue)...but I'm amazed that Reagan didn't seem to have any nausea or negative repercussions from it. So maybe we'll discuss this with her GI doc next week and see what he thinks about trying to give her something through the g? I know she's got extremely slow gastric emptying, so it may not be possible, but it can't hurt to discuss. Hopefully my girl sleeps tonight and WAKES UP tomorrow and has a good awake day! Reagan slept all night and then woke up this morning still sweet but sleepy. She was only awake an hour or so before falling back to sleep and then sleeping (pretty much) the entire day!! That's two sleepy days in a row! I don't remember the last time that happened. She woke up again for a couple hours tonight and was starting to get a little over excited (and we were fearing a meltdown), but it was late and a dose of clonidine helped her fall back to sleep. We have a night nurse tonight (the new one), so hopefully she'll behave herself and get some sleep. I'm a little worried what the next day or two holds but there's a chance she'll wake up happy, right?!?!? Here are some pics from the party (my mom went all out with the decorating)...all in all it was a good party. The decorations and food were fabulous, Reagan was in a decent mood, lots of family, several neighbors, and a couple therapists came to help us celebrate! (that matched her fiancé's outfit)! 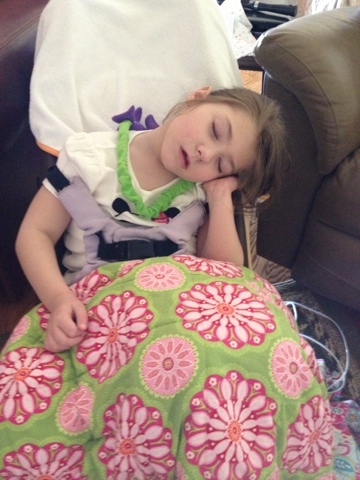 Reagan slept well last night and woke up a sweet, smiley, easy going girl again today! She's been great today. Just hanging out and kicking around while we decorated nonstop. She was great...her brother, not so much. SO needy!! I'm hoping they both get some good sleep tonight and wake up tomorrow ready for a great day!! 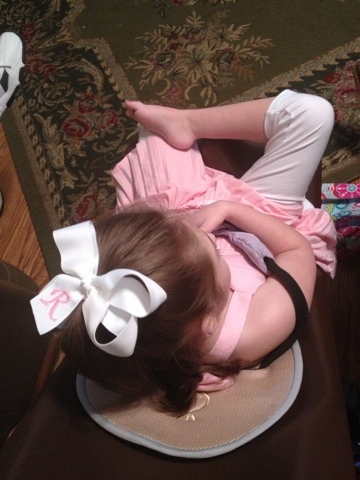 I'm PRAYING Reagan can hold out just ONE MORE DAY and have a good birthday party this year! Last year she was not having a good day the day of her party. Please please please say some extra prayers for her, that despite the clammy hands and sweaty back tonight, she pulls it out and has another good day tomorrow! Now...off to bed! It's 1:30am and tomorrow (today) is the big day!!! Reagan slept well last night and woke up a sweet girl again today. She's been very calm...her heartrate was in the 80s this morning! I don't remember the last time I saw it that low (even sleeping it's usually higher than 100)! She had PT this morning and then took a nice long nap. 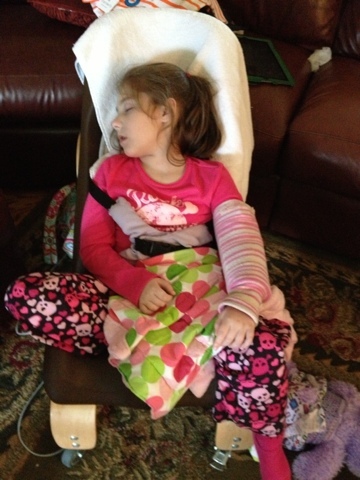 She woke up around 1pm when I was putting on her AFOs so the DME guy could adjust her stander. It's perfect now, so no excuses...she needs to get back into the routine of using it. The DME guy also had a delivery of her new stroller (a pink convaid cruiser). We got this to replace the Maclaren stroller she outgrew and to primarily use for doctor's appts. It's nice because it fits her perfectly, has tons of growth, folds up like an umbrella stroller (a large umbrella stroller), and is super cute in bright pink! My only complaint is the fact that it does not recline or tilt, but the convaid rodeo (which tilts), was much too bulky and heavy to be convenient to use on a regular basis. Reagan was such a trouper and put up with us moving her around and adjusting both her stander and stroller. Afterward we took a nice walk (had to test drive it) and then she went outside and went swinging for a while. She sure has been a sweetie. I hope she saves some of this cuteness up for the party on Sunday!